In our industrialized world, we are surrounded by occupational, recreational, and environmental noise. Very loud noise damages the inner-ear receptors and results in hearing loss, subsequent problems with communication in the presence of background noise, and, potentially, social isolation. There is much less public knowledge about the noise exposure that produces only temporary hearing loss but that in the long term results in hearing problems due to the damage of high-threshold auditory nerve fibers. Early exposures of this kind, such as in neonatal intensive care units, manifest themselves at a later age, sometimes as hearing loss but more often as an auditory processing disorder. There is even less awareness about changes in the auditory brain caused by repetitive daily exposure to the same type of low-level occupational or musical sound. This low-level, but continuous, environmental noise exposure is well known to affect speech understanding, produce non-auditory problems ranging from annoyance and depression to hypertension, and to cause cognitive difficulties. Additionally, internal noise, such as tinnitus, has effects on the brain similar to low-level external noise. 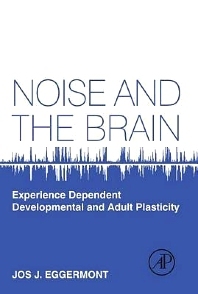 Noise and the Brain discusses and provides a synthesis of hte underlying brain mechanisms as well as potential ways to prvent or alleviate these aberrant brain changes caused by noise exposure. 9.4 Benefit of Music after All? 10.5 What Causes the Nonauditory Effects of Noise? 11.3 Where in the Brain is Tinnitus? Chapter 12. Protection Against Noise-Induced Brain Changes: Are there Safe Noise Levels? 12.10 Introducing New Legal Standards? Dr. Jos J. Eggermont is an Emeritus Professor in the Departments of Physiology and Pharmacology, and Psychology at the University of Calgary in Alberta, Canada. Dr. Eggermont is one of the most renowned scientists in the field of the auditory system and his work has contributed substantially to the current knowledge about hearing loss. His research comprises most aspects of audition with an emphasis on the electrophysiology of the auditory system in experimental animals. He has published over 200 scientific articles, authored/edited 8 books, and contributed to over 90 book chapters all focusing on the auditory system.